Based on the fact that Voodoo #1 is cover dated May 1952, I'm guessing this was Farrell promoting his line-up of new releases for May/June. The Lone Rider was his established title, but Voodoo, Rocketman and Captain Jet were all new titles for 1952. I'm guessing Spaceman and Captain Flight (which was the name of Farrell's first title back in 1944 under his Four Star imprint) were changed because rockets and jets had more appeal. 3) even though I scan eBay regularly, I have never seen the Rocketman, I could never have seen that Voodoo since the art changed (and I don't think the idea was used for a later Voodoo cover either). Anyway, now I am reflecting on the uncommonness of these Farrells. How is everyone perceiving the difficulty of finding Farrell copies? I know our expert PCHorror have an opinion. Note: This marks the 1-year anniversary of the thread, still going with the 130th entry and the collection added 80 books since I first started posting. In general, you can find the Farrell horror books. Even in high grade, they are no worse than most other publishers. I don't know about how difficult the other genres are because they are so cheap and probably aren't in high demand to bring to shows. 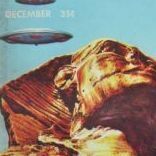 I found some info on Allen Anderson, who almost certainly did those Kid Cowboy covers you posted earlier in the thread. You need to pick up a copy of Illustration 11 (great magazine) as they show many covers by Anderson and Norm Saunders, who visited each other almost every day and hired the same models for their covers. This explains my confusing a few points of similarity between the artists that resulted in my misattribution. Here's a couple sample pages from the Magazine. I don't need to pick it up I have it right here in front of me! I have all issues from the mag since I've been picking it up from day 1; and I'll second your opinion, it is a must buy for illustrative arts fan. Kick me for being stupid because 1) I have the issue with the pictures you show but I took that issue on the road and came home before finishing reading it and simply filed it before hitting that article in full and 2) I talked to Dave Saunders, Norman's son, at last year's Windy City Con and he made the same exact comment about his dad's and Anderson's work (probably, the same thoughts went into this article) and still it didn't click for me. Thank you for getting back to us about it and it goes back on the reading pile. Glad I helped. I've enjoyed every issue so far and would have read it sooner but I stopped buying the usual fanzine materials for about 8 months last year. I've been dipping into my backlog slowly and only now as I'm ramping back up on my buying did I get to this one. Even though it's focus is on illustration, there's been quite a lot of cross-over appeal for us comic fans as they have featured a number of comic artists or artists who inspired comic artists. This one book has had me stumped for coverage for a while because, despite usual collectors' interest in Fiction House, little is known about Fiction House's artists. we see that the cover features are 1 - Wolf, 2 - Bear, 3 - Wolves, 4 - Puma, 5 - Wild Horses, 6 - Bear, 7 - the "odd one out", 8 - Bison, 9 - Bear. For how prolific Whitman was for Fiction House, little is known about the artist. I had always thought he was an older gentleman until I discovered recently that he had an extended career beyond the 50's and Fiction House as his work stretches to the 70's for DC. Whitman started work in the comics in the 40's with the Iger Studio then freelanced a lot of work still for Iger through the late 40's. Entering the 50's, his main account was for Fiction House and once FH ceased production, Whitman switched most of his output to Charlton carrying him through the late 50's working on any title that was sent his way. In the mid-60's, he is working for Wally Wood and then his comic output ceases until he shows up again in the late 70's and 1980 doing some work for DC, mainly on War books. Aside from this, I have no information on Whitman's background or age. Long Bow was also a steady feature in other Fiction House anthology books such as Firehair and Jumbo. IIRC, Long Bow is a Blackfoot orphan living with his tribe but with no parents around (obviously). Let me give you a quick synopsis of each of the stories, with scans as available. We start the story with Long Bow running away from a group of Ute indians, with whom the Blackfoot had been at odds. In reality, Keonta wants to make peace with the Blackfoot and returns as a token of his good intentions, High Bear whom the Ute captured as he was stealing horses from their village. in time to warn Keonta and his warriors who re-capture High Bear (Oh, the irony) and return him once more a prisoner to the Blackfoot chief as a token of their friendship. Say what you will, but that is too light a punishment for High Bear! 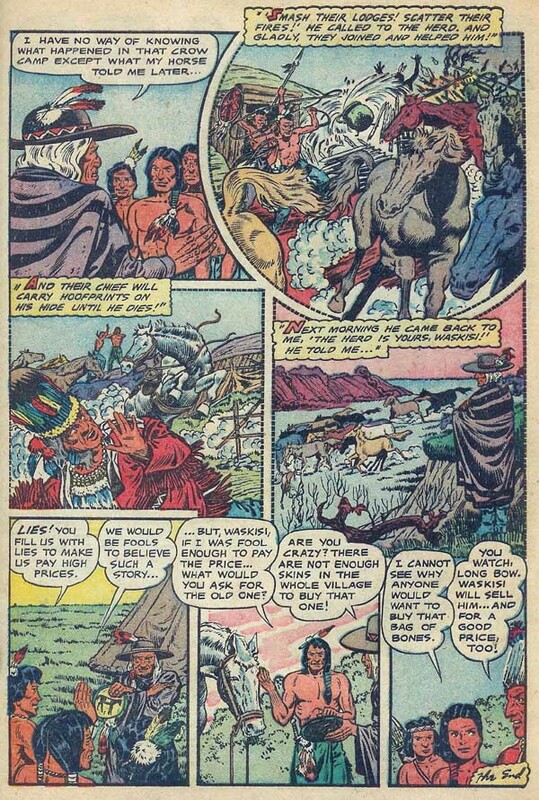 The Rattlesnake Raiders - As Long Bow spends the night at his friend's Little Moose teepee in company of Little Moose's sister Bright Star, the camp is attacked by a band of Mandan raiders. In the skirmish, a Mandan raider falls off his horse but successfully eludes a night search. Turns out, he is holding Bright Star hostage and demands the boys get 2 horses for him, which the boys proceed to do. On the first horse, the raider places a dummy so that Blackfoot warrior will go in the wrong direction while he escapes on the second horse. BUT as soon as he climbs on the second horse, he is thrown down and overtaken by the boys. The raider had a rattlesnake collar and the boys chose a snake-shy horse who was sure to throw the attacker. Long Bow and Little Moose receive the chief's accolades for catching a snake with a snake. Oh and all this in 4 pages! No Bendisizing a story here. Buffalo! - The tribe is ready to hunt a buffalo herd and the boys (Long Bow and a friend) are watching and helping in company of Star Reader who educates them about buffalos after it is announced that there is a spotted calf in the herd on whose head the chief has placed a 2 horse reward. The two boys spot the spotted calf and go after it in hope for the prize. However, they are not the only hunters on the prowl as a pack of wolves is also hunted for the calf. Ironically, the calf's mother saves the boys who, of course, decide to let the family go rather than go for the prize. Big Thunder - The least interesting story of the book. The boys are near Big Thunder, the father of the Blackfoot nation, a giant face on the side of a cliff when they hear a Pawnee band attacking a pack train. The group of settlers scatter in hope the Pawnees won't be able to capture them all. A young boy tries to cross a river and falters and the young Blackfeet rescue him and take him in the cave behind the waterfall coming down the side of Big Thunder, only to be greeted by the Keeper of the Sacred Cave who provide bow, arrows and ropes. These allow the boys to fend off the Pawnees long enough for the Blackfoot warriors to come to their rescue. You've figured out already that there is no Keeper and that it was Big Thunder's spirit who came to the boys rescue. The Magic Horses - A feeble horse traders arrives to the Blackfoot camp with a group of Crow horses for trade. The trader explains that his village was attacked and burned by the Crow two moons ago. When he woke up in the wreckage, a white horse talked to him and took him away to the Crow camp. After talking to 2 ravens who fetched 2 coyotes for the horse, the horse arranged for the Crow's horses to stampede and escape and the talking horse then proceeded to explain that the herd was now the trader's. All this while, the Blackfoot's chief is careful to tell Long Bow to pay attention to the trader's tale and to notice that upon such marvels, he will get a good price for his herd of horses. That's it. It was a nice lot of 5 stories in this book with the first, second and third the best of the lot. The gimmick in the fourth one is too overused to be that pleasing and while the last had potential, it could use a little more development. Here's an important book in the sense that it was long running. According to Michelle Nolan, when it turned 100 with the February 1950 issue, it was the 28th Golden Age series to do so, having started back in 1941. Bugs Bunny's origin was as a goofy antagonist for Porky Pig in the Warner Bros. cartoon Porky's Hare Hunt (1938), directed by Cal Dalton and Ben "Bugs" Hardaway, for whom the hare is named. Plotwise, it was virtually a repeat of the previous year's Daffy Duck intro, Porky's Duck Hunt, Back then, (our) Bugs was much smaller and more rabbit-like, and completely white — but in wit, resourcefulness, and the sheer relish with which he demolished his antagonist, he very much resembled his later self. Bugs evolved in a generally Bugs-like direction for a couple of years, emerging fully-developed in the Oscar-nominated A Wild Hare (1940), directed by Tex Avery. It was there that he first munched a carrot, first uttered his trademark line, "Eh, what's up, Doc? ", and first kissed Elmer Fudd. The only thing missing was his name. He'd been referred to as "Bugs's Bunny" from the beginning, but it was only in Elmer's Pet Rabbit (1941), directed by Chuck Jones, that he was first called "Bugs Bunny" on-screen. Bugs also received an Oscar nomination for Hiawatha's Rabbit Hunt (1942), and won the award for Knighty-Knight Bugs (1958). Both were directed by Friz Freleng. Other well-remembered Bugs cartoons include Tortoise Beats Hare (1941), by Avery, which re-enacts the old story; The Old Grey Hare (1944), directed by Robert Clampett, in which Bugs, known for sometimes-spectacular death scenes, tops himself by digging his own grave; Hillbilly Hare (1950), directed by Robert McKimson, which contains the tour-de-force "square dance scene", one of the greatest sustained gags in animation history; and What's Opera, Doc? (1957), by Jones, which crams Wagner's entire Ring Cycle into a seven minute cartoon. The last theatrically-released Bugs Bunny cartoon was False Hare (1964), by McKimson. But The Bunny never faded away. He continued to appear on television, not just in packages of cartoons sold to local TV stations and on his network Saturday morning show, but also in commercials advertising a variety of products. In comics, Bugs did not fare so well. He appeared in both newspaper strips and comic books between the 1940s and the '70s, but none of them truly captured his character; nor were any notable writers or artists associated with him. In recent years, he has been revived as a comic book character, appearing regularly in the monthly Looney Tunes Comics, an occasional oneshot or mini-series of his own, and even as a co-star with Superman." "The following is an attempt to chronicle his [bugs] early existence and to give credit where credit is due. In terms of his prehistory, Frank Tashlin told Mike Barrier, "Bugs Bunny is nothing but Max Hare, the Disney character in The Tortoise and the Hare. We took it - Schlesinger took it, whoever - and used it a thousand times." Opinions differ on this theory of plagiarism, but it is tougher to accept when one studies the earliest versions of Bugs Bunny. Max Hare was a brash, cocky character, it's true, and some of this may have found its way into Bugs Bunny by osmosis, but Warner's rabbit was wilder and wackier than the Disney creation by a country mile. This is especially true of the first rabbit who appeared in Porky's Hare Hunt, directed by Ben Hardaway in 1938. He bears more than a passing resemblance, personalitywise, to the screw-loose Daffy Duck who debuted a year earlier in Tex Avery's Porky's Duck Hunt. This same character was revived a year late in Hare-um Scare-um, co-directed by Hardaway and Cal Dalton, and filmed in color. The design was altered somewhat, mostly to accomodate color, but an important feature was added - prominent buck teeth. Bugs was an aggressively nutty character, teasing and torturing an unsuspecting hunter (not Elmer Fudd) and singing his own praises. In 1940 Chuck Jones used the rabbit in an important transitional cartoon, Elmer's Candid Camera. The significance of this cartoon lay not in its development of Bugs per se, but in the development of Elmer Fudd, and Bugs's relationship with him. Notice that the Bugs Bunny character became an instant cartoon star because very shortly after his "creation", he was featured, alongside Porky Pig, on the cover of Looney Tunes and Merry Melodies. Notice the cover is faithful to the 1940 model sheets. In that first issue, according to Mike Brandenburg in CBM 42, "eight stories are presented, the first of which is "The Wild Hare". It features Elmer and Bugs and is an eight page retelling of the classic story of wabbit hunting [Note: and an adaption of A Wild Hare]. "SH... be vewy quiet ... I'm hunting wabbits!" The second story is "Porky's Hired Hand", and is also eight pages. In this tale, Porky hires Gregory Grunt from the Cornstalk Employment Agency to be nightwatchman at his chicken house. A pesky fox tries his best to outwit Gregory, but loses in the end when Porky shows up. Sniffles the Mouse makes his debut in the third story where he befriends a sleepless girl (Mary Jane). They go on an adventure and find some magic sand which reduces her to his size. An average day with dad is shown in the fourth tale called "Tom Thumb in Trouble". Dad, of course, is a giant in comparison to Tom. Porky's Hollywood Sketchbook is a feature and serves as a break between stories. It portrays the likes of Mickey Rooney, Judy Garland, Jackie Cooper and Charlie McCarthy in caricature. Pat Patsy and Pete make their first appearance in comics in the fifth story titled the same. This one is by Mickey Mouse artist Win Smith and is a cure yarn about an expedition in the south seas in a search for rare specimens for a New York zoo ... and the unexpected discovery of cannibals! Elmer ends up in jail in the next story called "Elmer and his Magic Wand." This is a four page outing in which Elmer buys a magic wand in hopes of doing tricks ... and with the help of Bugs, a string of bad luck. Bugs foils enemy spies and takes a test flight in the next classic feature. "Model Airplane Contest" is its title and it makes reference to Axis forces. This is the first time in the book that a reader might be reminded of the conflict in Europe. Before ending the book, we find "Pokerhuntas and Captain Johnny Smith" as the last offering. This pokes fun at the pilgrims and of the Mayflower landing." It is interesting to compare the line-up in the very first issue to this issue released 11 years later. We find Bugs, Porky, Elmer and Mary Jane and Sniffles still holding down the fort and entertaining us as seen in the following scans. Bugs First Page - Notice how the art is not typical big foot art. And they were probably thrilled to sell it and keep hoping that guy who bought the Looney Tunes will come back and buy more... little knowing that you needed it for your nefarious scholastic purposes. Congrats on the one year! Love the thread. Be forewarned that we are entering a lengthy loving stretch extending from Love Adventures to Lovers' Lane via Love Diary and Love Problems and Advice Illustrated among others. Luckily for us, we start this romantic escapade in the world of funny romances with not only an Atlas book, but one with a special treat for us. "Morris Weiss (born August 11, 1915, Philadelphia, Pennsylvania, United States) is an American comic book and comic strip artist and sometime writer, active throughout the 1940s and 1950s. He created the teen-comedy character "Margie" for Timely Comics, and was the final cartoonist on the once-popular comic strip Mickey Finn. Weiss befriended a host of notable artists, including James Montgomery Flagg. As a member of the National Cartoonists Society, he proposed the idea of a charity fund for members on hard times, which Alex Raymond developed into the Milt Gross Fund for Indigent Cartoonists. Weiss was the inker and assistant on cartoonist Lank Leonard's Mickey Finn from 1936-1943 and again from 1960 on. He took over the strip in 1971, following Leonard's death in August 1970, continuing through the final Sunday strip on December 21, 1975, and the daily strip's finale on July 31, 1976." Concentrating on Weiss's relationship to Timely, after he got discharge from the service, Weiss first worked briefly for Charlie Biro at Lev Gleason before " [going] to Timely. Stan Lee looked at my samples and said he needed someone to draw a teenage features. He gave me a Tessie the Typist -script. I brought the job in and Stan said, "No, this is too straight." He wanted the characters exaggerated more and showed me what he wanted. I went back, did it over, and Stan said, "You gave me exactly what I wanted," and we hit it off. As part of his output, as mentioned above, Weiss created Margie whom he modeled after his wife Blanche. Later on, Weiss would switch to produce more Patsy Walker and Wendy Parker stories. He particularly relished working on the latter as Wendy is his daughter's name. Here's another reminiscence from the early 50's. "Stan called me up one day on a Friday morning. He said, "Morris, we're short one more book to get to the printer. We have to pay the printer for so many books and if we don't have another comic book ready, we'll be paying for a comic book we're not getting. How many pages have you got done now?" I said, "I have about 6 or 7 pages." He said, "If you can come up with 18 more pages by Monday, we'll have a book. You're the only one I know who can turn out that kind of work and it'd be okay." I said,"I'll tell you what I'll do, Stan. I'll sit at the drawing board and see what I can do. Now, if you don't get the work, it just means it wasn't humanly possible for me to get the work out." Stan said, "I can ask for no more from you, Morris." I went upstairs, took a shower, and went to the race track." Weiss was able to produce fast work if he wasn't inking his pencils of course. If he decided to pass on the pages for inking, he would pass the pages along to Kurt Schaffenberger who didn't work directly for Timely as Stan thought that his work wasn't flashy enough. It was not uncommon for Weiss to also write the scripts to his teenage stories. Prejudice Page by Weiss - Even though Weiss mentions not particularly caring for drawing Romance, I find he had ease in posing his characters. Just follow the main female character across the page. 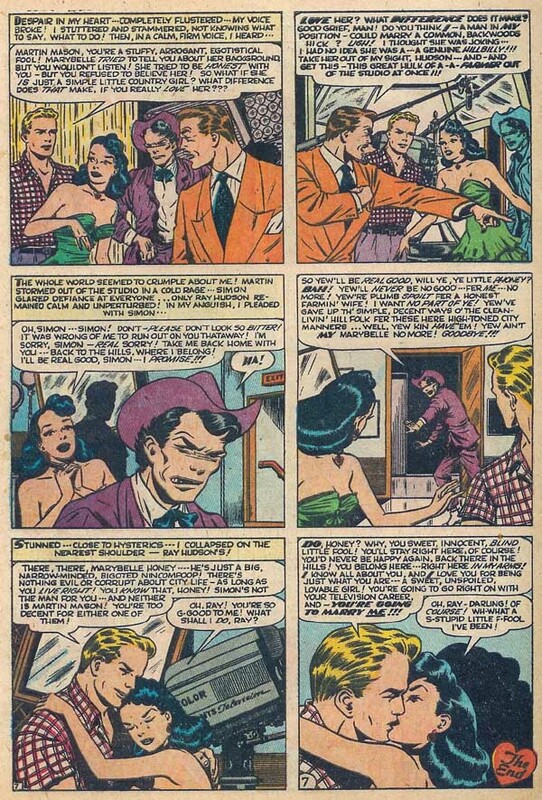 Notice the dates correspond to the period after the super-heroes were cancelled and before Everett had enough steady Venus and Marvel Boy scripts and soon Horror scripts to keep him busy and away from Romance. Nonetheless, look at how much work Everett puts into this job! Enjoy. The Everett story in Romance Tales #8 was so great we even exclaimed about it in the description on our website. It's got a real horror feel, esp. at the beginning. My favorite Collectors Society feature returns! Pillar of popular culture? Why, wasn't it only a week ago that members here listed the top ten characters from comic books recognized worldwide, and Bugs didn't even make the list? What's Opera, Doc? (1957), by Jones, which crams Wagner's entire Ring Cycle into a seven minute cartoon. That's my favorite version of da wabbit. Wilder and less polished that the version that survived. 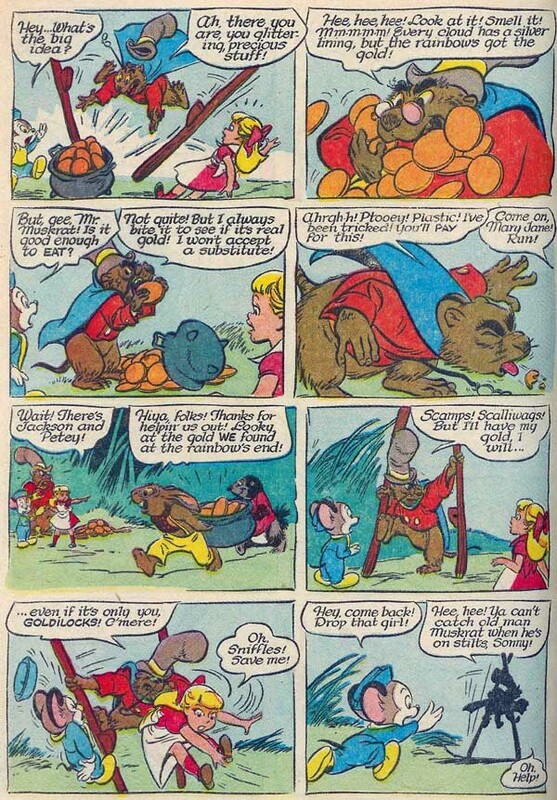 Sniffles the Mouse makes his debut in the third story where he befriends a sleepless girl (Mary Jane). They go on an adventure and find some magic sand which reduces her to his size. They're my favorite feature of the Looney Tunes and Merry Melodies that I've picked up. I suppose the fact that the name is funny in a *nudge -- wink* late 60s underground comics way, consistent with "getting small" with the magic sand, helps. The plots are totally wild and uninhibited. Definitely Alice in Wonderland ("Eat me!" "Drink me!") was on the creators' minds as well. Can you imagine what Crumb, Moscoso, Shelton and the gang could have done with this feature? This wasn't really Sniffles' debut -- he had appeared in several WB animated shorts in the 1930-40's, but this was his first team-up with Mary Jane. Everything about the feature is first-rate -- even the lettering! Toonopedia says that Roger Armstrong worked on it in the 40s and Al Hubbard in the 50s. Do you know anything about them? Is that Armstrong's own lettering that I like so much? Didn't the lovely calligraphy (look how he changes the font on GOLDILOCKS for effect) disappear later in the series, perhaps when Hubbard took over? Do you have the Four Color issue with Mary Jane and Sniffles as cover feature? They languish on my want list. Probably not all that expensive -- just hard to find for lack of interest. 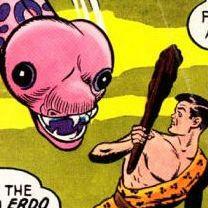 That one almost made my Golden Age non-superhero nominees! Everything about the feature is first-rate -- even the lettering! Yes, it was difficult to decide on just 1 page from that story but I have to place limits on the scanning (esp. since I had just scanned the Everett story). This page was selected for the excellent fourth panel. Thanks for your interest and the info about possible artist on this feature. As for Sniffles first appearance, the CBM article did mean comic appearance as Sniffles's cartoon birth, as you mention, predates Bugs's. OK by me! The romance books of this era are oddly fascinating. My favorite romance book title!!! Some very strange cover to that series. ....Nonetheless, look at how much work Everett puts into this job! Enjoy. Is this essentially a Loretta Lynn story? What a fabulous page! Y'know, something about those faces is almost manga-like. Must be the exaggerated expressions and those strong horizontal lines. Great stuff. "a disgrace to th' state o' Kaintucky"
The hillbilly jock made me think of The Goon and his sidekick! Duh? Which Goon? You can 't mean Alice the Goon from Popeye -- she was a she -- and the sidekick/bodyguard -- and bare-chested! Well, blow me down! I have yet to see Everett work from this time period where he didn't do work of the highest quality. He seems to be going for an updated Jack Cole look, doesn't he? How come his little pal has blunked-out eyeballs? Related to Little Orphan Annie?